Smokey and a Real Bear! 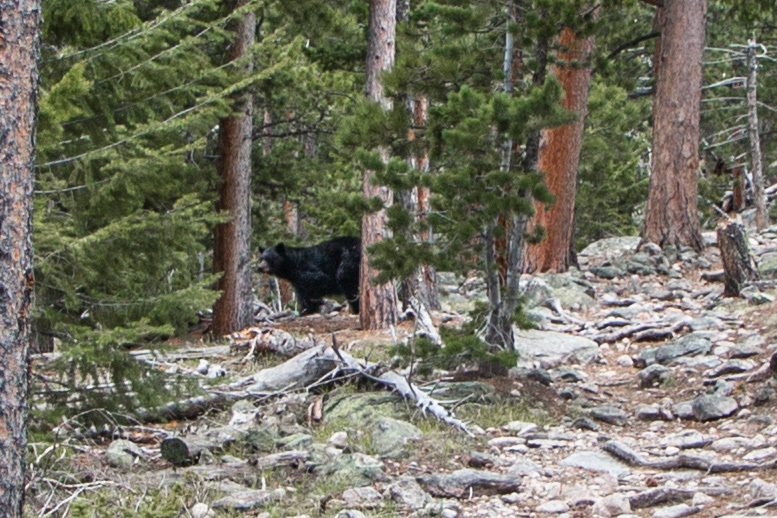 After hiking for many years in the Colorado Rockies, I’d never seen a bear while on the trail. That finally changed while hiking on the Sandbeach Lake Trail. Usually, I don’t let a little snow slow me down, but this week, the snow was perfect for postholing. That’s where you take a step on the crusty surface of the snow, and it seems like you’ll stay on top. Then wham, your foot sinks. I’d only hiked in a few miles, and was eager for more, but wasn’t wanting to deal with the snow. I headed up the south side of Lookout Mountain, and climbed to the top of a huge rock outcropping. The views were stunning. As I looped back down to the trail, I knew that I was being watched, or actually being warned. I didn’t see the bear, but I heard it. Camera ready, I wandered about slowly, looking, and hoping, but to no avail. I really wanted to know where the bear was, so that I could move appropriately out of its territory. I eventually gave up, and headed back to the trail. Within a few hundred yards saw a mamma bear and her cub. Before I could get my camera up, she grunted, and the cub bolted. I only managed to get one marginal picture of her, before she bounded into the forest, following her cub. Coincidentally, I ran into Smokey the Bear a few hours later. 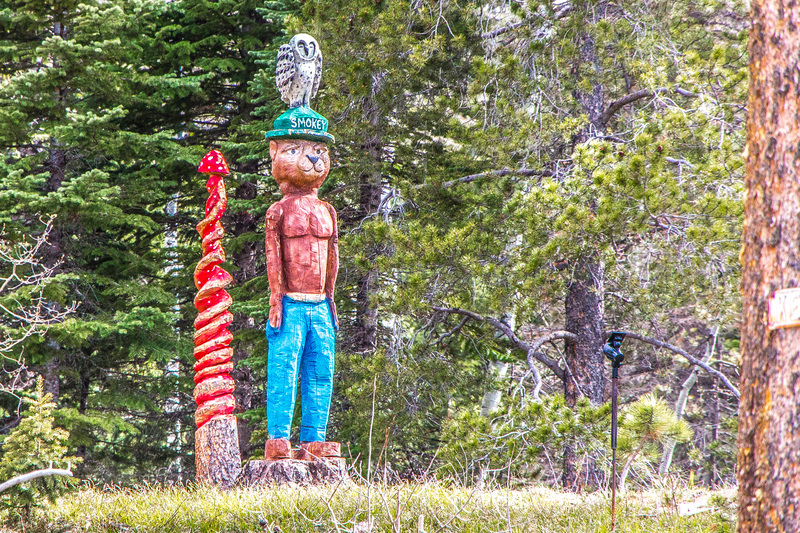 I was driving around Allenspark, CO, looking for a trailhead that I wanted to find, when I drove by a property with multiple carvings from dead trees. I guess Smokey went on a serious diet! 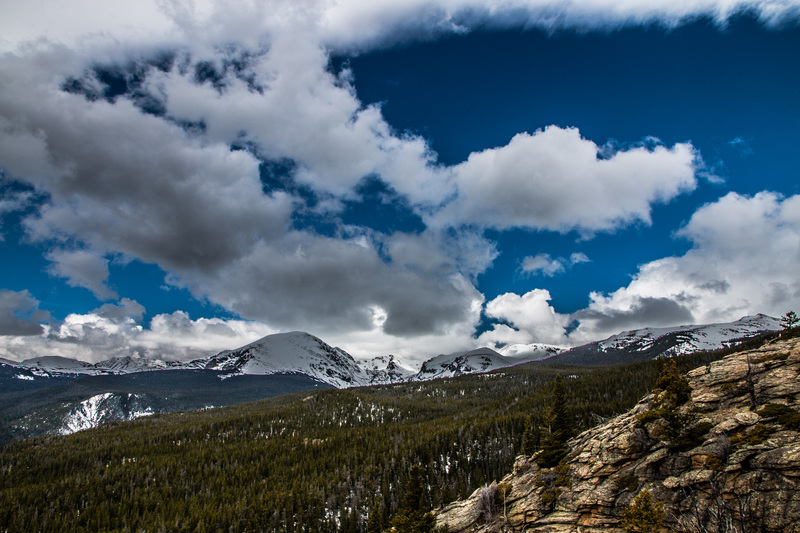 Disclaimer: I am an avid and experienced hiker and photographer in the Rocky Mountains. I do NOT recommend that you seek to get close to any wild animal that you encounter in the wild. I highly recommend that you move away from any wildlife that you encounter in the wild. Bears, lions, moose, and other wildlife can be extremely dangerous.